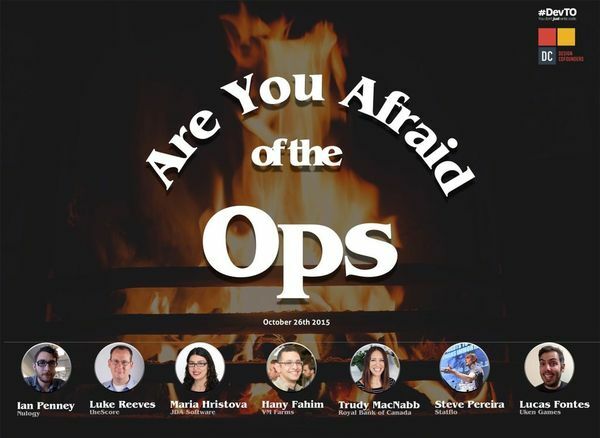 Are You Afraid Of The Ops? Join us this month at Design Cofounders for an evening of tales shared from the front lines of the DevOps world in Toronto. Steve is a software delivery and operations specialist and 18 year tech veteran. Starting from repairing PCs through tech support to IT management, moving to an eventual focus on large scale cloud operations and developer workflow. He’s worked with and consulted large enterprises and small to medium startups in areas like automation, continuous delivery and deployment, scaling and web operations. Steve joined Statflo as CTO in May of this year to help it scale and meet demand for it’s wireless customer experience software. Statflo uses carrier and POS data to help wireless retail stores improve service, work smarter and turn customers into advocates. He runs Toronto’s monthly DevOps and OpenStack meetups and the DevOps Days Toronto conference, and is an active member of Toronto’s vibrant tech community. Maria has spent her career in tech moving between QA, Support, Dev and Operations focusing on early stage bootstrapping projects both at startups and at large enterprises. She spends her days sitting on the edge of her seat wondering “What now?” and living the unpredictable life of running a DevOps organization. She preaches the gospel of DevOps and is determined to abolish the virtual fence which Devs and Ops use to throw things over. She began her career at Microsoft before that was considered a liability and has worked at a number of startups, each one of them a liability in its own hilarious way. Ian Penney – Fábula de Tres Anillos Malignos (Tale of the Three Evil Rings). Ian Penney has been working as a Systems Administrator and Systems Manager for over 15 years. He’s worked at large companies like the Canadian Broadcasting Corporation and other enterprises through an IBM business partner, as well as with over 200 startups, from coast to coast.A few years ago, he realized Infrastructure as Code was the future, and so he began focusing on using tools like Chef, Puppet and Ansible.Most recently he’s celebrated his first happy anniversary at Nulogy as the lead of their Infrastructure Team during a rapid transition towards “moar devops” and less risk. Trudy had been a mainframe sysprog for 6 years at both the Ontario Government and RBC financial institution. In January 2014 she decided to take HackerYou part-time course in Ruby on Rails. After freelancing on the side for a year on various RoR projects, she finally decided to take the plunge, quit her job and took the HackerYou full-time webdev bootcamp in January 2015. Now she freelances full-time. Lucas Fontes is the Chief Architect at Uken Games. He’s DevOps by day, Top Fragger by night. Lucas survived data-center migrations, integer rollovers, bad nics and power outages. Currently he is focused on microservices and realtime communication in Ruby and Go. Luke is the Director of Software Engineering at theScore. He split his career between development and operations, and still trying to be somewhat involved in both. Luke enjoys working with higher level languages and platforms such as Ruby, Rails and Python and he is a large proponent of leveraging free software to increase productivity and prevent people from re-inventing wheels.